More than one million accountants and auditors in the United States make an average annual wage of $71,000 per year, according to the Bureau of Labor Statistics. Statistics like this were introduced to the high school students who recently attended the Second Annual Accounting Career Awareness Program on Point Park University's campus. ACAP is a program of the National Association of Black Accountants. During the six-day program, students from high schools across the Pittsburgh region learned about accounting as a career choice, how to start a business, financial literacy, the art of public speaking, business etiquette and more. 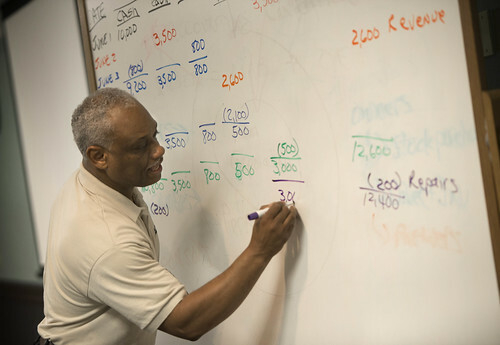 Led by Edward Scott, C.P.A., M.B.A, Point Park's George Rowland White Endowed Professor in Accounting and Finance, the goal of ACAP is to increase understanding about the field of accounting and its career opportunities among high school students in underrepresented minority groups. "Job growth and strong compensation packages are common in the accounting profession. We want to get the word out to young people about these opportunities," said Scott. Scott talked to the students about his life and what led him to where he is today. He recounted the struggles and triumphs of his high school and college years, and the people who inspired him to enter the accounting profession. "You always have a need for mentors in your life," he told the students. The ACAP students also heard presentations from business professionals throughout the region and had the opportunity to network with them. They visited several public accounting firms in Downtown Pittsburgh, engaged in team-building exercises and took part in "Funfest" which included a pizza party, cosmic bowling and laser tag. "We had another successful program this year. Of the 13 students who did not plan to pursue a career in accounting before they came to ACAP, six are seriously considering a career in the field and three remain open to the possibility," explained Scott. "With these results, I believe we accomplished our objective." Tell us about your week at ACAP. Several of the high school students took a few minutes to give us a recap on their ACAP experience including what they learned and their favorite parts about the week. Below are their responses. "My week at ACAP was the best way to begin my summer, and the rest of my life. I learned a lot, not only about the profession of accounting but how to network with professionals. I'm so thankful for this program and for Professor Ed Scott. I appreciate all he did for us." "I learned something from every single person who came and spoke to us. Professor Ed Scott really put so much time and effort into this. Also, the speakers from Ernst & Young really made me open my mind to careers I never thought about." "I enjoyed meeting new people who are interested in the same things as I am. Some of the people I met this week will turn into lifelong friends. I learned how versatile accounting is and how an accounting degree can really cover a lot of ground and help you get into many different careers." "My week was very exciting. I got to see what an accountant does and how many big corporations there are in Pittsburgh. I learned that each type of accountant is very different. This week opened my eyes to what I can do. I'm definitely considering accounting." "The sessions were really interesting and informative. My favorite part was the field trip to Funfest. I liked meeting new people this week." "I wasn't quite sure what to expect but this week ended up being a lot of fun. I met a lot of great people. The best parts were Funfest and hanging out with everyone. I came here because accounting is part of business and I plan to study business in college."